The HANNA HI 736 Checker HC bridges the gap between simple chemical test kits and professional instrumentation. The HANNA HI?736 is both accurate and affordable.The HI 736 CheckerHC portable handheld colorimeter features a resolution of 1 ppb and 5 ppb 5% of reading accuracy and uses an adaptation of Standard Method Ascorbic Acid. Hanna Phosphorous Checker, Ultra Low Range HI736. The HANNA HI 736 Checker®HC bridges the gap between simple chemical test kits and professional instrumentation. The HANNA HI736 is both accurate and affordable. The HI 736 Checker®HC portable handheld colorimeter features a resolution of 1 ppb and ±5 ppb ±5% of reading accuracy and uses an adaptation of Standard Method Ascorbic Acid. 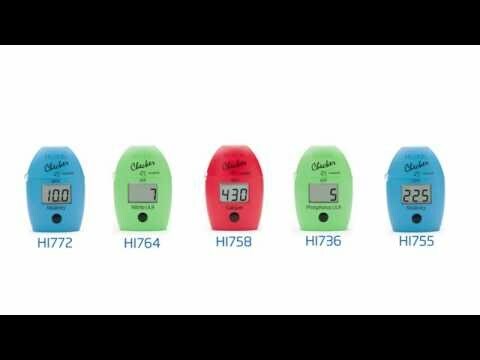 The HI 736 Checker®HC is extremely simple to use. First, zero the instrument with your water sample. Next, add the reagents. Last, place the vial into the Checker®HC, press the button and read the results. It’s that easy. HI 736 Checker®HC is supplied with sample cuvettes with caps (2), powder reagents for phosphorus (6), battery and instructions. Method adaptation of the Standard Methods for the Examination of Water and Wastewater, 20Th edition, Ascorbic Acid method. Using the HI713 I never detected any phosphate, so bought this one instead. 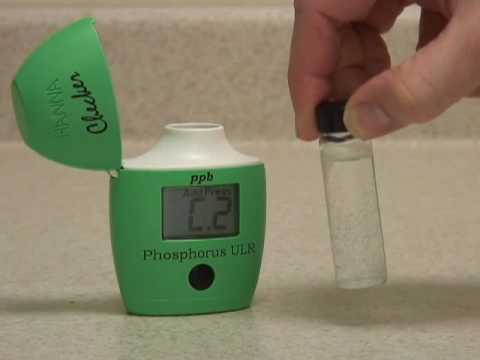 NOTE--this one is calibrated for *phosphorus*, not phosphate, so is only about 4x as sensitive as the HI713. Anhyow, the HI736 still still didn't detect any phosphorus in my tank, so I made a dilute solution of TSP just to see if the thing even detects anything! Short answer--yes, the testers do report phosphorus/phosphate when it's really there. Anyhow, the HI713 and the HI736 *do* detect phosphate when it's present but reported more than I expected from my dilution. This was just a sanity check with Savogran TSP cleaner--not lab reagents, so don't expect accuracy (correct numbers)--just precision (repeatable numbers).